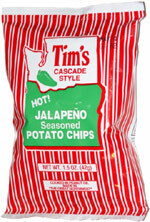 Taste test: These are truly some of the best chips I've ever had. If you can't handle really hot stuff, don't even try them. They're really hot. Really. I mean, eat one or two, and you're all set. Definitely plan on having these with a cold beverage. But heat isn't all they've got going for them. They're also really thick, crisp and crunchy. These are truly good chips. Smell test: There's a good, strong jalapeño kick to it when you first open the bag.